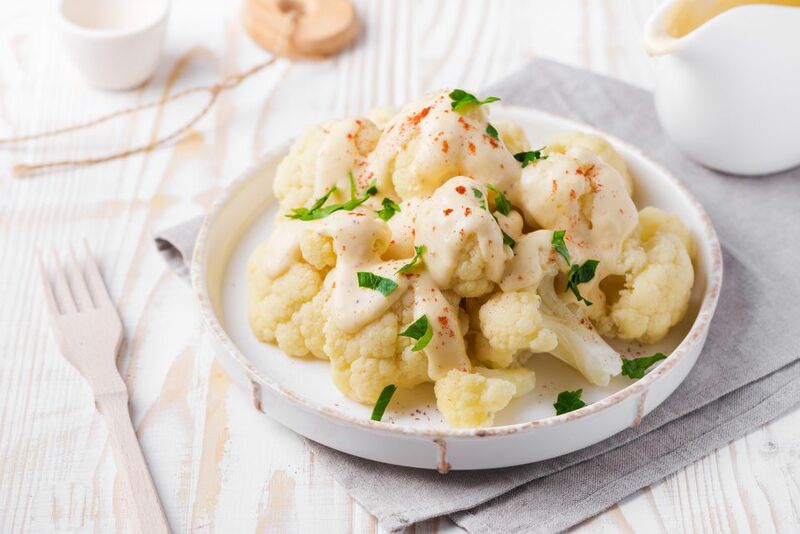 A rich and creamy cheddar cheese sauce transforms plain steamed cauliflower into an irresistible side dish. ​This is really a very quick recipe to prepare, and it is one of my favorite side dishes. Have all ingredients measured and ready, and the dish should be ready to serve in less than 10 minutes. Feel free to double the sauce ingredients. Separate the cauliflower into small florets. Put the florets in a steaming basket over about 1/2-inch of simmering water. Cover and let the cauliflower steam for about 5 to 8 minutes, until crisp-tender or tender, depending on how you like it. Meanwhile, prepare the cheese sauce. Melt the butter in a saucepan over medium heat. Add the flour, ground mustard, and nutmeg and cook, whisking or stirring constantly, for about 1 1/2 to 2 minutes. Gradually whisk in 3/4 cup of the milk or half-and-half and continue cooking, stirring constantly, until thickened. Stir in the shredded cheese and continue cooking, stirring, until the cheese has melted. Transfer the cauliflower to a serving dish and spoon the sauce over it or serve the cauliflower and pass the sauce separately. Add some spinach to the dish for additional color. Garnish with paprika or chopped fresh parsley.